Version 2.2 of the Shortcuts app, updated on Tuesday, gives users a number of options for interacting with the Notes app via a Siri request, or by another automatic action. The update allows users to "Create Note," "Append to Note," "Find Notes," and "Show Note" within created shortcuts. The "Get Numbers" command aims to make it easier to acquire numbers from text, by extracting the digits from the other characters, with the results able to be used as part of other commands. The "Get Travel Time" command has been enhanced to provide more details in a request, including the distance to travel, the arrival time, and the route's name. The update also includes other smaller usability, performance improvements, and bug fixes, such as tapping the Library tab will now scroll to the bottom of a shortcuts list. 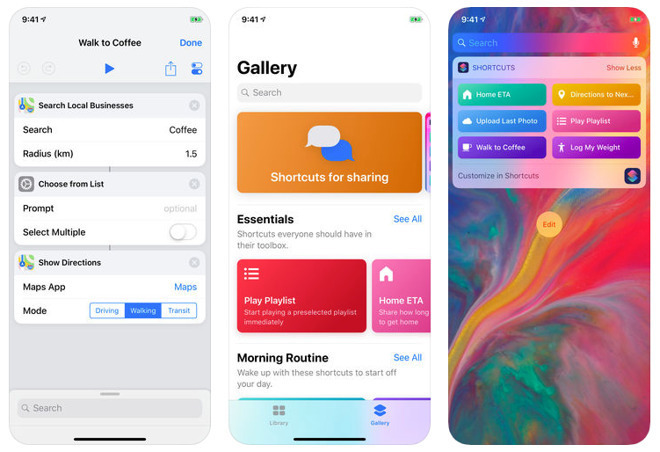 Shortcuts 2.2 is a free download from the App Store for iPhones and iPads running iOS 12 or later. Under the latest update, the app is now 141 megabytes in size.